1953 was indeed a peculiar year. On the comedy or musical front, With a Song in My Heart took the Globe from Singin’ in the Rain, later to be celebrated as the best musical of all time and inspire generations of filmmakers (including Damien Chazelle, winner of the same award in 2017 with his La La Land). In the drama category, Fred Zinnemann’s masterpiece High Noon would be remembered by cinephiles as a great example of American filmmaking at its best – but the Golden Globe (and other awards) went to Cecil B. deMille’sThe Greatest Show on Earth, a 152-minute (with two intermissions) celebration of life and love under the Big Top. A partnership (it would be called product placement these days) with real circus giant Ringling Brothers & Barnum & Bailey, The Greatest Show on Earth was shot - on four different locations, plus Paramount’s famous backlot in Hollywood - in lavish Technicolor with a rich budget of $4 million, real circus acts, and an all-star cast: James Stewart (as Buttons the Clown, a man with a tragic past who never removes his stage make-up); Charlton Heston (who had never met deMille, but grabbed his attention by waving at him on the Paramount lot) as the circus manager; Cornel Wilde (who had a serious fear of heights) as a high wire and trapeze artist; Betty Hutton as a trapeze star; and Dorothy Lamour a singer/juggler. Not one to be left behind in his own greatest show, deMille narrated the picture with gusto: “We bring you the circus—that Pied Piper whose magic tunes lead children of all ages into a tinseled and spun-candied world of reckless beauty and mounting laughter; whirling thrills; of rhythm, excitement and grace”, were his opening words. He also demanded that his stars learned the circus tricks they had to perform on camera, resulting in a series of injuries, but also some truly thrilling moments on screen. 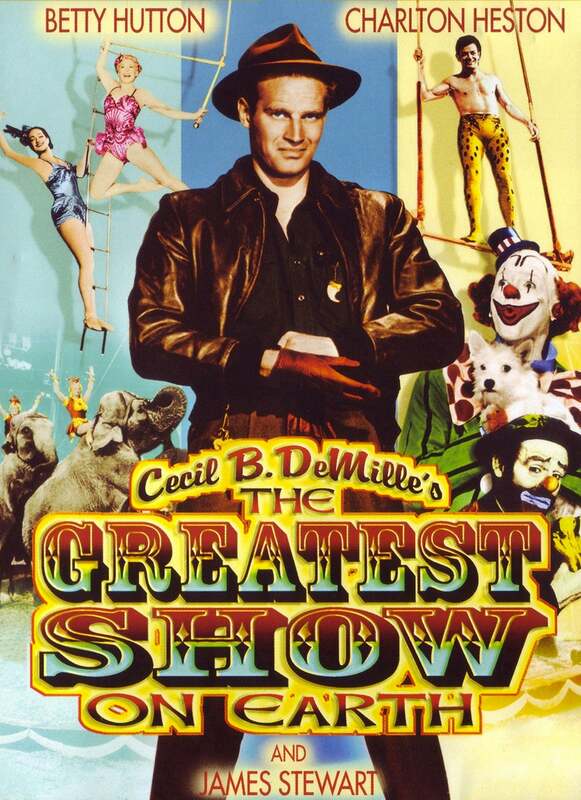 The Greatest Show had a lukewarm reception among critics but went on to become the highest-grossing movie of 1952, and won three Golden Globes – Best Motion Picture, Drama; Best Director for deMille and Best Cinematography.